2nd book in The Old Car Nut Book series. I have a car for sale. I’ve only had it a couple months. It’s a 1966 Pontiac GTO that I bought on a whim to help a friend of my nephew. He’s 35 years old, got a girl pregnant, and they’re going to get married. This guy had it for about five or six years and didn’t want to part with it, but he needed the money. My nephew told him that I’m into old cars and so, they brought it over. I had an extra space in the garage and I negotiated a price with him. The expectant mother’s family owned a mechanic shop over in Torrance. He gave me all the paperwork on the car that he had generated and the file from the previous owners. There is a lot that is right with the car and he’s spent over $13,000 on it through the family business. It’s a great car and I’ve been straightening out some small issues that they hadn’t gotten to. Someone put a radiator and fan setup in and it kept blowing fuses. I started looking at it closer and each fan needed its own fuse, its own hot line. Somebody had both fans connected to one fuse. I’ve finished the last of those minor issues and I’ve got it all straightened out now. I wanted it to be problem free when I passed it on. I got the car for a reasonable sum and figured I’d fix it up a little bit and I could turn it and make a couple grand. So, I stripped the motor down, took the TriPower off, repainted the block, cleaned it up a bit and put it all back together just the way it’s supposed to be. I have it for sale for $35,000. It books out at $38,000 with the four speed, but it’s not matching numbers. It has a 400cid in it. If it had the numbers matching 389cid, it would up it another twenty-five percent. Like every other car for sale, it will sell when the right guy comes along. I’m in no hurry. I do this sort of stuff for therapy. I received a phone call about “the goat” from a woman one day. She explained that she wasn’t calling to ask the typical questions a car buyer might ask, saying that she wanted to know if she could rent my car for a few hours. She went on to explain her odd request. 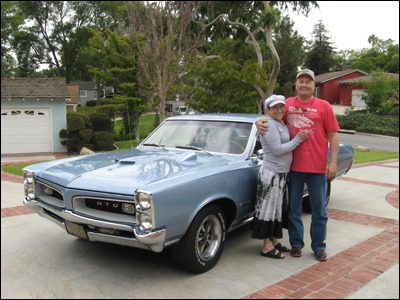 Her husband, Gordon, had a GTO 4-speed, similar to the one I was selling when he was younger. Gordon had come down with cancer and the doctors were going to begin chemo and radiation treatments. Because the outcome was uncertain and cancer treatment has a way of really taking its own toll she asked if there was some way possible, before he started his chemo, that she could rent the car for a few hours to let him play with it. When I heard his story it touched my heart, because we’re all getting older, all of us car guys. I started to feel my own mortality, thinking he’s even younger than I am. He’s 65 and I’m 70. So, I told her there wouldn’t be a problem. Considering the circumstances, I wouldn’t rent it to her, but all I really would want is some identification and insurance information. We set up an appointment for them to come over and she asked me to have the car in the driveway. So, when they drove up she told Gordon, “I have a surprise for you” and there was my GTO sitting in the driveway. I was watching them from inside the house. They walked up to the car and he was looking all around it. I could see the stars in his eyes. Then they both started to walk to the front door and I greeted them at the bottom of the staircase. I thought I saw stars in his eyes, but they were actually tears. So then, she explained to him that I was letting them to take the car for a few hours to go play with it. He was almost balling. It was a really an amazing moment. He said that he had owned a black one and that he had to drive it at night, because his also didn’t have air conditioning, nor did it have power steering or power brakes. When he’d go for any real distance, he said he would always drive at night, going from point A to point B, because it was so damned hot in the car. We just kind of laughed about that. My car has a Hurst shifter from the factory, so it has no power accessories or air conditioning. It’s basically like his was, but it’s blue and his was black. Another difference is that he bought the black car brand new. I don’t know how long he had the car, but apparently, it was stolen. So, he obviously had great admiration for the GTO. It had been his favorite car. To start out, I took them for a ride in it. It’s a four speed with 355 gears and tri-power. It really launches, so I drove the car and got on it a little bit and then put him behind the wheel to drive back. I coached him and nudged him, saying “Go ahead and step on it. You know, kick in those other two carburetors. Feel the GTO. His car also had tri-power. So he got on it, and as we were driving back into my neighborhood, I said, “Look, I want you to drive it like you stole it.” Then I tapped him on the shoulder and said, “Don’t steal it, though, okay?” We had a good laugh over that. When we pulled back in the driveway I said, “Go enjoy it and drive it like a GTO.” I got out of the car and they left. They were gone for about two hours and I got a phone call from Gordon’s wife, Malka. She told me that they were down at the beach. I lived in Fullerton, about 30 miles away. They went to lunch and she told me that they might be a little longer than planned. I told her it wasn’t a problem and that my only request was that they fill the gas tank before they brought it back. They brought the car back four hours later and I met them in the driveway. We talked about where they went and about his experience driving the “Goat.” I took a picture of them with the car and they thanked me. Actually, she gave me a copy of his medical report, which my wife and I read. It’s pretty touching. The plan was to do a bone marrow transplant and start some chemo on his neck. That’s where I guess all the cancer is located. So, you know, things don’t look too good for him in the future. I was just happy to do this for them. Without thinking about what might happen, I posted a comment about their visit and letting them take the car on Facebook and my daughter responded with a big posting saying I had done a “make a wish foundation” type of deal and everybody made a big deal about what a great guy her dad is. All the accolades I was getting kind of threw me. I wasn’t expecting all the attention. I just wanted to do something for the guy and his wife. It was an opportunity to make a difference in someone else’s life and he had a great time. I was able to make him happy for a few hours and I just think that’s something that us older car guys try to do when we can. I didn’t expect anything from it and I’m sure most of my old car buddies would do the same thing. In my opinion, the guy’s wife really deserves the credit, because she found me and set it all up. So, I think that it’s a great thing that she did for her husband and to me, she is the hero of the story.